"Y'up Mush!" colloquial Bradford slang for 'Hiya mate how's it going'? 'Mush' - An old Romany word, meaning "my good friend". "He's a right Chava/Chavo" - colloquial Bradford slang for 'he's really common'. 'Chav' - has its origins in the Romani word chavi meaning child/youngster or chavo meaning boy. The above picture chosen for this blog was chosen for its ambiguity. I googled the term "Yorkshire Person" and out of the top few images that came up not one of them looked like me. This has been something that I have lived with most of my life. Not to say that there aren't people in Yorkshire that look like me - there are! Tons! There are many descendants from the Caribbean, India, Pakistan, Afghanistan, Romania, Africa and now more recently Eastern Europe. But if we were to go on what we are being or have been shown in the media, you would sill believe that the biggest county in the whole of the UK is full of Seth Armstrong (Emmerdale) types living on farms. If you read my posts regularly you will know I speak of 'types' a lot. 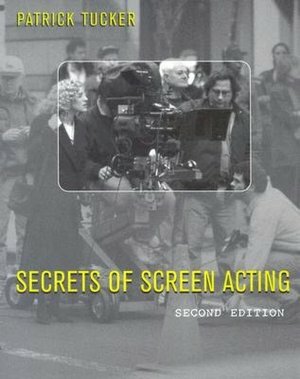 For the longest time in my career as an Actor I was trying to figure out my 'type'. Where was my place in stereotypical society, what was my niche? As a novice in the industry I clung to the most obvious ones with the most obvious and cringe worthy names such as 'urban' and 'street', to which I'm sure I still belong. But as I got older and more experienced in my career, I began to realise that actually - there ISN'T really a stereotypical media 'type' I fall under. It is in fact a mix of a few that I have fused together in my own head. The 'type' I thought I belonged to, as far as Acting goes, doesn't really even exist! In my mind I would fall under such umbrellas as: Urban, street and gritty. You know all the crappy terms that describe poor black culture/art. But then I would also fall under: Northern, working class, brassy, 'salt of the Earth, common. You know, all of the usual stereotypical terms that describe poor white culture. So for looks I'm one box and for personality I'm the other, which is a big problem for casting (by today's standards in the UK). Now forget for a second that I am of dual heritage (get me about "duel heritage"! Took a while for me to get into saying that). Forget that I am both black and white for a minute (this is not the time to argue the toss) and focus on the 'of black descent' and 'northern'. So just to be clear we are focusing on 'black descent' and 'northern'. Now I'll give you 30 seconds to think of 10 people in the media (Actors, Sports Personalities, Musicians, Presenters etc) that are of 'black descent' and 'northern'. Get ready - no cheating - GO! Now whether you used the timer or not I bet you had a difficult time naming 10. You probably got 5 tops and most of those were from Xfactor, Corrie or very recent Olympic winners? Am I right? And even they were mostly very light or mixed race females am I right? I reckon I'm almost right! You see on the whole northern people "of colour" don't seem to exist in the minds eye of the media. We have the 'urban, street, gritty' black people of the south in one hand. You know your Top Boys, your Kidulthood's that kind of thing. Then we have the working class, socialist, 'salt of the Earth', white people from the north in the other. Like Kelly from 'Misfits', things like 'Trollied' etc. Two separate entities and as it seems never the twain shall meet. There is still prejudice against northern accents and even more so a 'north/south divide'. It's 2012 and the way people in this country speak about accents, (particularly northern ones) is shocking. It's almost a form of racism and definitely a prejudice that is overlooked, (I say racism because to my knowledge we do not have a word for prejudice against accents, but it is THAT serious). I get asked all the time - by southerners "do you ever have to change your accent?" or "are you keeping your own accent?" It always makes me laugh and sometimes I ask back "yes are you keeping yours?" The look on their faces is a picture! You see it would never enter someone with a southern accent to change theirs unless the part required it, yet with northerners its expected, required or not. There is an unspoken tradition/train of thought that a northern accent is bad, undesirable and low class. An expectation that I should somehow be ashamed of my accent and try and hide or alter it as a southern accent is more desirable and has connotations of high class. I'm so adamant about keeping my accent and being a pioneer for northern performers standing by their accents, that I almost go Seth Armstrong myself when I'm working. I first noticed it on 'Kerching!' I was surrounded by southern Actors. Some cockney even, which is just as regional! Hearing these accents and my flat, broad Bradford accent at the side of theirs, I realised that I had unconsciously started making my accent even stronger. As if my unconsciousness was staking a mini protest that my accent was here and staying. Luckily the people at Kerching! embraced my northern-ness and even incorporated it into the show, but not everyone is as forthcoming. Slang, accents, colloquialisms all take time to be established. Unlike with the world of twitter and facebook, traditional slang took lifetimes to be passed down and rooted. There is history in those words, there has been struggle and there is meaning. Accents have history and a story behind them. For someone to assume that we have no history, no culture, no story or presence, or that none of those things are valid because we don't have a southern accent is frankly both arrogant and uneducated. Well my questions started when I saw this picture of Jessica Ennis and her family. I saw her dad and saw a black man. A black man who was probably born and lives in Sheffield South Yorkshire. A region of Yorkshire that has a strong accent. Then I realised that we STILL have hardly any black northern personalities on the TV. Yeah we can assume that Jessica's father is from a Caribbean background and has a way of speaking that is both bits of patois and standard English, but there is still going to be some Yorkshire pud in that talk. Where are the men like him on our screens? Where are the women? The last part of advert below shows a guy called Desmond I think and he was featured on a show called 'Make Bradford British'. Didn't watch the show because I didn't believe in the agenda, but this is just one example of how 1 black Bradfordian speaks and guess what? He's a proper Yorkshire pud! Yeah sure he too probably goes in and out of broken patois but he is as broad as the day is long. I want to see more variation on the northern stereotype on our screens! I want to see a Rastafarian Landlord in the Rovers Return. I want to see my Aunty Regina sat on the checkout on 'Trollied' (not literally she can't act). I want to see my mate Dermot teaching his kids on Waterloo Road instead of always drafting in a southern teacher (who would NEVER come up here to work on a northern wage anyway). I want to see Milky's dad on 'This is England'! As long as I live I will keep my accent. Of course if a role requires me to adjust it I can and will but, beyond that nobody will ever make me feel ashamed or make me turn away from my history, my roots, my culture or my background. If it's good enough for Sean Bean - its good enough for me! 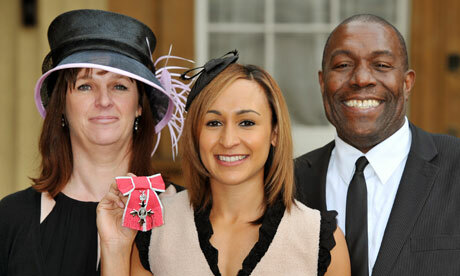 Jessica Ennis' Dad came to England as a 6 year old from Jamaica so I'm CERTAIN he will have a REAL Yorkshire accent. 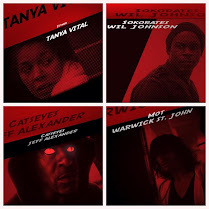 I am EXTREMELY proud to have you as a friend Tanya and think that more people need to see your words. As a fellow Bradfordian and amateur performer I am proud to read this blog, it is so true that Northeners are either expected to change their accent or get a job on Emmerdale, with accents throughout the UK merging more and more into just one common accent, arguably because of TV, it is such a shame all these generations of accent and dialect will eventually be history. So I only got into RADA didn't I? !